The left-back slotted in a Rory McAllister pass in the eighth minute to settle a scrappy contest at Balmoor. The victory extended a fine run of form for Jim McInally’s men, who moved four points clear after Edinburgh were beaten by Clyde. Boyle said: “That is four wins on the trot so to keep the run going was vitally important especially with how tight it is. “I do not score many goals so it was pleasing to get the winner but it was a hard-fought win and we made it difficult for ourselves. “It is brilliant to score and brilliant when it means something to keep us at the top of the league. Boyle’s finish was calm and composed. Rory McAllister robbed Jordan Lowdon of possession on the right flank and he squared for the former Airdrie full-back, who stroked in from 16 yards. Elgin could have restored parity within three minutes when the home goalkeeper Greg Fleming pushed out a cross to Chris McLeish, who shot wide. The home team put together a slick move in the 31st minute, which deserved a better finish from Derek Lyle. The veteran striker could not keep his effort down from 12 yards after Ryan Dow neatly flicked the ball into his path. Elgin should have levelled just before half time after wasting a counter attack. Ross McIver broke clear from Scott Roberts’ pass but his effort was well saved by Greg Fleming. McAllister thought he had doubled Peterhead’s lead in the 55th minute when he flicked in a header but he was deemed to be in an offside position. Jamie Stevenson then tested Kyle Gourlay with a well-struck 25-yard free-kick, which needed to be pushed over the bar and the visiting goalkeeper made another fine save with seven minutes remaining to deny Scott Brown, whose 12-yard shot seemed destined for the top corner. 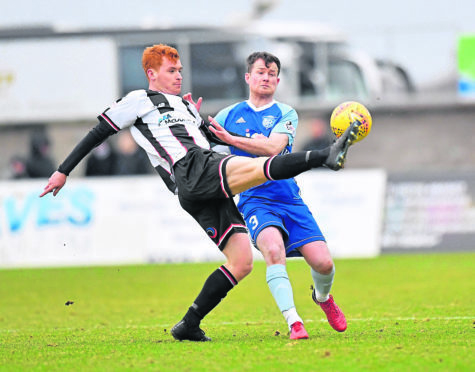 But Peterhead did enough to rack up a fourth straight win ahead of tomorrow’s trip to Cowdenbeath, the second meeting between the teams in a week. Boyle added: “It is strange playing the same team again but I remember playing Forfar seven times in one season when I was at Partick Thistle. “It is not ideal because the players begin to know each other’s games inside out and it can make it a dull affair. “It will be different down at Central Park compared to what it was here. Elsewhere in League 2, Clyde leapfrogged Edinburgh City to move into second place with a 1-0 victory when the sides met at Broadwood. David Goodwillie scored the only goal of the game from the penalty spot after he was fouled by Liam Henderson. The Bully Wee ended the match with 10 men after Tom Lang saw red for a second bookable offence. Annan Athletic, sitting fourth in the table, boosted their hopes of making the play-offs with a 2-1 victory over Queen’s Park. The Galabank side are 10 points ahead of fifth place Stirling Albion and 11 ahead of Elgin City, who have a game in hand. Stirling Albion won 2-1 against Cowden at Central Park thanks to goals from Darren Smith, who was then sent off, and Peter MacDonald. Former Peterhead winger David Cox on target for the Blue Brazil. Bottom club Albion Rovers picked up their eighth point of the season with a 1-1 draw against Berwick Rangers. George Newell put Rovers in front before Calum Adamson equalised at the death.